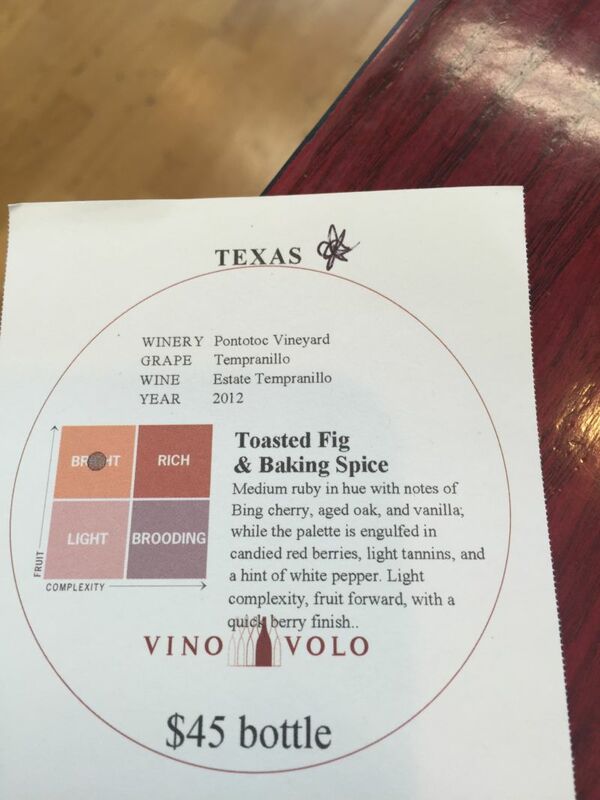 While waiting for my return flight to Oakland I was sitting in Austin airport and noticed a Vino Volo. I had about 45 minutes to kill, so I thought I might stop in and have a glass of wine before taking-off. I had never been to one of these little wine bars, even though I had seen them many times traveling in and out of the Bay Area. The Brit had stopped in a time or two while I grabbed an iced coffee. I had no wine to drink the entire time I was in Texas. I was too busy drinking Margaritas with a sangria swirl. When I texted The Brit to tell him what I was doing, he replied with “Your commitment to our blog knows no bounds”. I think he was being sarcastic and not congratulating me on my brilliance at creating a chance to review wines. I’m thinking he was just really jealous. The Brit Comments: Yes, I was jealous. I was working whilst receiving texts from California Girl with pictures of the wine and telling me how much she was enjoying it. I feel sorry for The Brit, really, I do! I sat down and looked at the menu. I noticed they had an entire tasting of wines from Texas. I had been told that there are wineries outside Austin, but I didn’t get to visit any while I was there. I would think that it would be difficult to grow grapes due to the climate in Texas (torrential rains followed by long droughts). I was right, there isn’t much of a wine industry in Texas; just a few vineyards with grit and determination trying to make something good. I first sampled the 2014 Viognier from Pedernales Cellars. Whilst the tasting notes talked of fresh-cut pineapple and crisp ocean, I didn’t get that. Nor did I taste orange blossoms either. The wine was crisp and dry, lacking in the fruits one would normally associate with Viognier. I found it to be too dry with a very mineral tone and a rough finish. It did nothing to advance my thinking about wines from the great state of Texas. 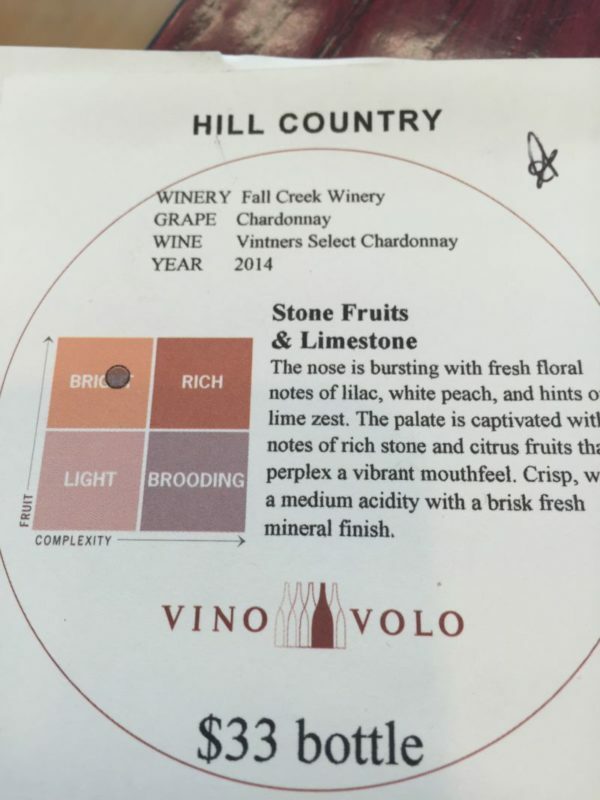 I then moved to the 2014 Fall Creek Vineyards Chardonnay. This was a far nicer taste, even from the smell. There were apple and pears on the nose. The flavor was crisp and clean with no oak or butter; nice fruits and floral notes, ending with a soft, smooth finish. I could see myself drinking this wine. For $33 per bottle it was on the pricey side for a wine of this quality, but hey, not too shabby. The next taste was a non-vintage blend of Syrah, Cinssalt, Mouvedre, and Carignan. It was called Les Copains and was from the McPherson Winery. The nose was of strong berries, it had soft tannins, plums, cherries, and lots of spice on the palate. I think this wine could be good with a few years under its belt. I think that would give it an opportunity to soften and ripen so that you can really enjoy the spices. At $25 per bottle, again, I think its pricey, but it could be a good pick given a few years of age. My last taste was a 2012 Tempranillo from Pontotoc Vineyards. It was their Estate Tempranillo. The tasting notes talked of toasted fig and baking spice and I would say that was pretty much spot on. I really enjoyed this wine. Out of the line up, it was the only one I went back to and finished the entire sample. I could taste the cherry, the oak, the fig, and all the spices for a wonderful rich sip. With age, I think this one would be really great. Priced at $45 per bottle, I have to wonder how it compares to similarly priced wines in the Napa Valley. I can’t honestly say that I would pay that much for this bottle, even though I enjoyed it. I have had wines sub $25 that to me have better flavor and value. But, it was from Texas and it was good. So there ya go, Texans can make wine! Im glad that you enjoyed our review Don. It is so hard to price wine I think. 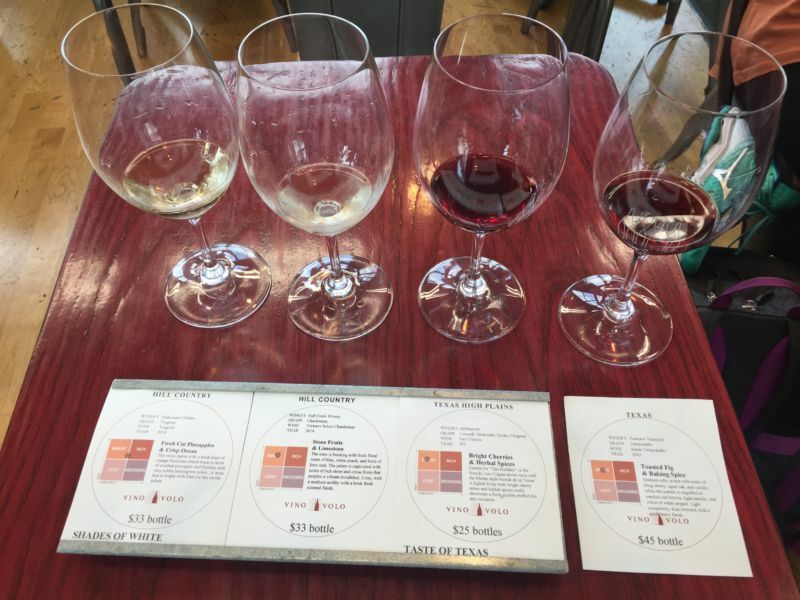 I try to compare wine values for wines that I feel are similar quality. But it is all about how much it takes to produce as well. Congrats on your gold medals. If we have the opportunity we will check out more of your wines. Thanks for commenting.